His reliability and ability to complete tasks in a timely and efficient way are qualities he has developed in his time working at the thrift store. He has established himself as a leader and inspires others within LifeChange. However, his current success comes from a troubled past. He had a traumatic childhood experience that, to this day, affects him. He witnessed his older brother beating his mother in an argument leaving her unconscious. His mother died a week later in the hospital. "I didn't know what being redeemed meant or what recovery looked like. The only thing I wanted for myself when I came here was just a better life, and God is delivering it to me on a daily basis." He slowly shut the world out from him after his mother’s death. He started hanging with the wrong crowd while drinking and taking drugs. Carl said, "I just didn't care about life anymore." His addictions drove him to commit crimes to the point of serving eight years in prison for his second armed robbery. He continued to live a life addicted to alcohol and drugs after his release from prison. Fast-forward to 2014. He found himself homeless, drinking, and smoking crack cocaine on the streets of Portland. Desperately wanting to change and get out of his destructive cycle, a chance encounter with a staff member led him to LifeChange. Since then, he has surrendered his life to Jesus Christ. His trust in God supplied him with all the things he needed for a better life. Carl said, "I didn't know what being redeemed meant or what recovery looked like. The only thing I wanted for myself when I came here was just a better life, and God is delivering it to me on a daily basis." Help others like Carl by supporting the Union Gospel Mission's Thrift Store and give a second chance at a better life. 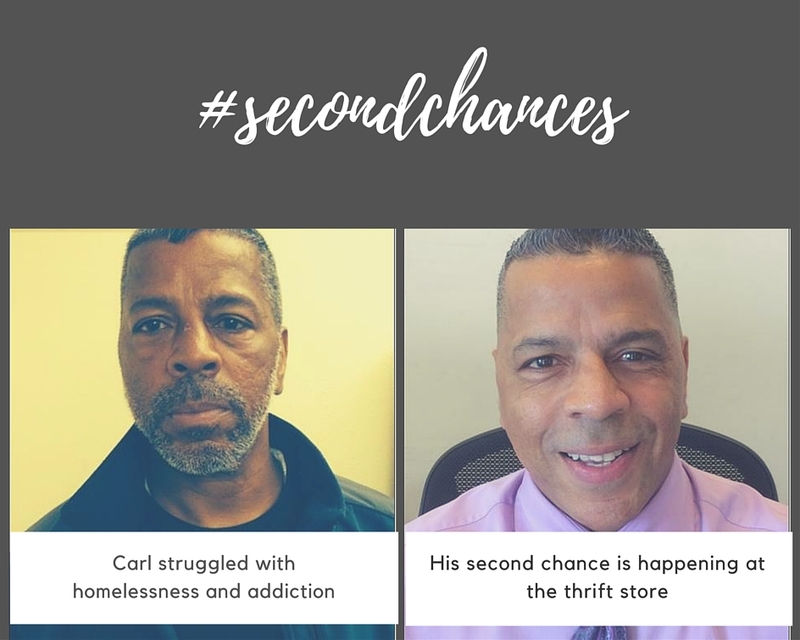 When you shop at the thrift store, take a selfie of you and the item you bought and share on Facebook and Twitter using #secondchances and #ugmthriftstore.